In response to competitive pressures and rising costs,Consumer Goods Manufacturers benefit from improved capabilities, and revenue management solutions that provide business users with an insights-driven business-planning platform to help them optimize their trade investments. 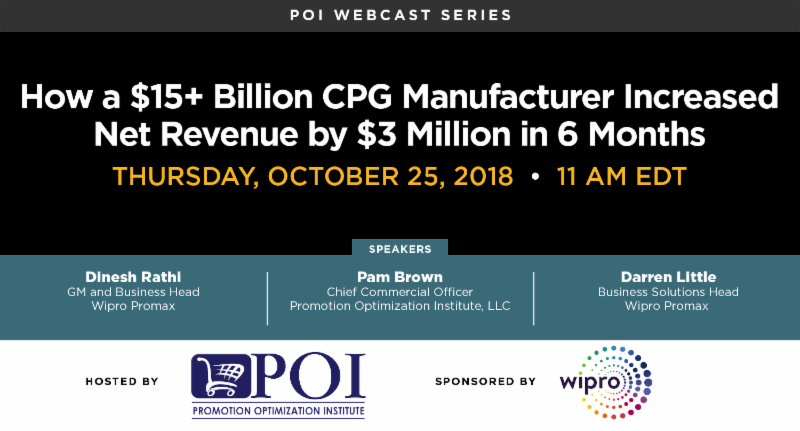 Beyond trade spend optimization, CPG’s look to improve their ability to predict, and shape promotional demand,which in turn are proven to reduce costs through effective inventory management practices. A platform to support extensive data transformation requirements (syndicated data, retailer POS data, master data, and P&L inputs) with varying formats, hierarchy levels and frequency. Integration with existing trade promotion management system. Advanced machine learning framework-based modeling capabilities. Pre-built templates to provide visibility to key KPI’s to support global a design approach yet have the ability to conﬁgure to meet market speciﬁc requirements. Attendees will also learn about data transformation and insight-driven planning capabilities required to shape demand and drive proﬁtable growth, facilitated by predictive modeling software, in a machine learning based framework. Driven by the success of the initial pilot, this CPG has now deployed the solution to seven more countries, covering the business for an additional 20 retailers. Attendees will also get a first look at impressive early results of the 2018/2019 POI TPx and Retail Execution Survey, with Pam Brown! For the first time, POI Dallas 2018 features this session with lightning talks 12 -five-minute talks presented sequentially without interruption. The point of each lightning talk is not to give a detailed talk but rather to present briefly the latest and most interesting technological advancement. They cover the vendors capabilities, start with the good stuff and end making a point. Going forward, we expect Amazon’s combined global online sales to increase from $130 billion in 2018 to over $180 billion by 2020. We forecast the company’s net revenues to increase from $178 billion in 2017 to $235 billion this year. We further expect this figure to increase to over $340 billion by the end of the decade. See what’s new at the POI Fall Summit in Dallas! Be part of the dialogue at POI – In addition to getting a copy, time with the Author, Pam Brown, and insights on promotional performance improvement (including Digital, AI, and Advanced Analytics, those entering have the opportunity to earn a $500.00 Amex gift certificate! Please take the survey here!